Hair loss can be devastating for the millions of men and women who experience it. Now scientists are reporting that a substance from honeybee hives might contain clues for developing a potential new therapy. They found that the material, called propolis, encouraged hair growth in mice. The study appears in ACS’ Journal of Agricultural and Food Chemistry. 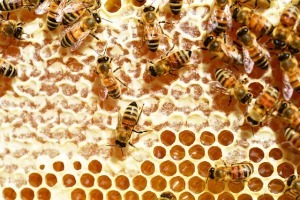 Ken Kobayashi and colleagues note that propolis is a resin-like material that honeybees use to seal small gaps in their hives. Not only does it work as a physical barrier, but it also contains active compounds that fight fungal and bacterial invasions. People from ancient times had noticed propolis’ special properties and used it to treat tumors, inflammation and wounds. More recently, research has shown that the substance promotes the growth of certain cells involved in hair growth though no one had yet tested whether that in turn would result in new locks. Kobayashi’s team wanted to find out. When the researchers tested propolis on mice that had been shaved or waxed, the mice that received the treatment regrew their fur faster than those that didn’t. The scientists also noticed that after the topical application, the number of special cells involved in the process of growing hair increased. Although they tried the material on mice that could grow fur rather than balding mice, the researchers note that hair loss conditions often result from abnormal inflammation. Propolis contains anti-inflammatory compounds, so they expect it could help treat balding conditions. They add that further testing is needed to see if the beehive material affects human hair follicles.